A traditional said Holy Communion Service using the Book of Common Prayer. On the third Sunday in the month "A Prayer Book for Australia" First order is used. 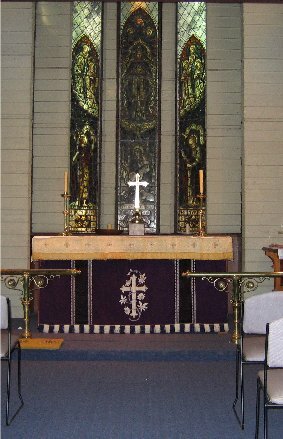 A Contemporary style Worship Service of the Word and the Sacrament of Holy Communion including a Sung Eucharist with hymns and songs using "A Prayer Book for Australia" Second Order. Baptisms as arrranged. A Healing Ministry is available at the conclusion of this service. A weekly Sunday Noticesheet gives full details of the Sunday and weekday activities, including any changes to the above (see also "The Week Ahead" on our home page). Baptism, Confirmation, Marriage or a Funeral.